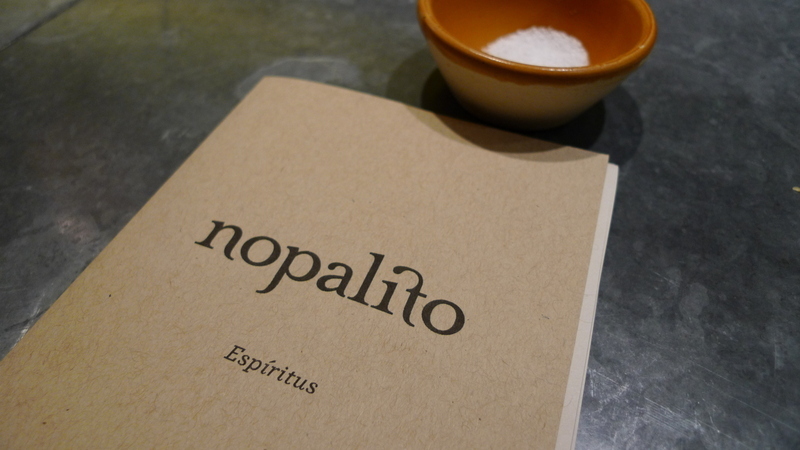 While in San Francisco, I met up with fellow Xangan Jason to try Nopalito, a Mexican restaurant that made it into the San Francisco Chronicle’s Top 100 Restaurants listing earlier this year. 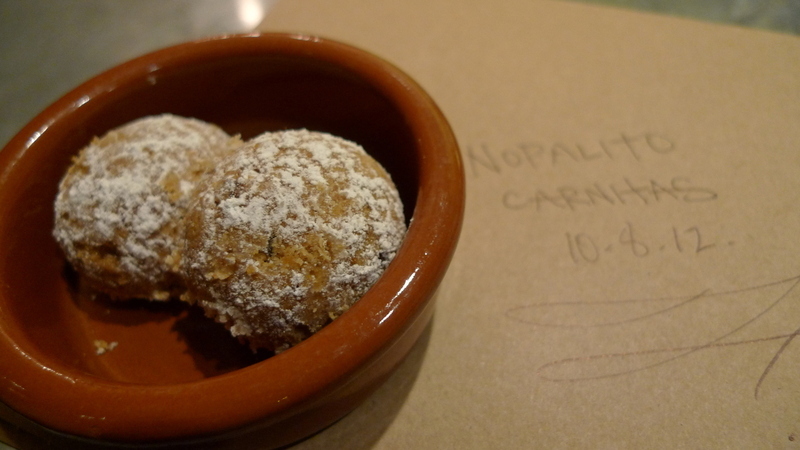 The genesis of Nopalito reportedly came from the staff meals prepared by chefs Jose Ramos and Gonzalo Guzman at owner Laurence Jossel’s nearby California-Medierranean restaurant, Nopa. The conceit is that in a city chock-full of taquerias and inexpensive burrito shops, Nopalito delivers Mexican food with an unusually high level of attention to detail and quality. Located in the Western Addition, close to the Golden Gate Park panhandle, Nopalito buzzed on the weekday evening when Jason and I visited. 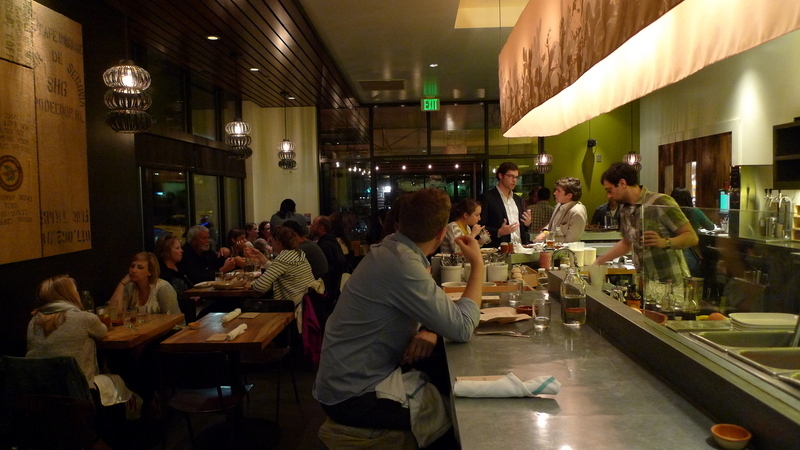 While the restaurant was busy, we were able to score two seats at the counter overlooking the kitchen with no wait. The restaurant’s interior has an unfussy, minimalist decoration that is warm and inviting. Tables are close together but the volume doesn’t reach unbearable levels. 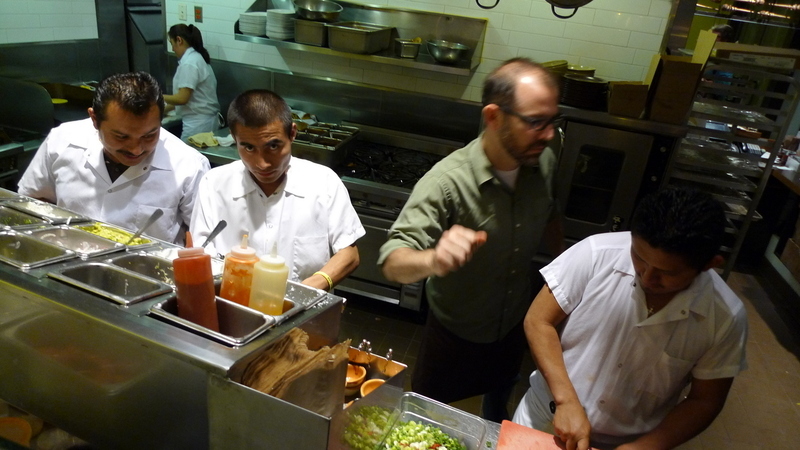 The staff, including the cooks, are friendly and engaging. Within moments of being seated, our server had placed a dish of spicy fried corn in front of us, given us menus, and brought water. The menu follows the “small plates” style that has become de rigueur in the San Francisco dining scene, with selections that were inexpensive (about $4.50 to $16) and easy to share. We glanced at surrounding tables and across the kitchen to identify dishes that looked interesting and quickly settled on five. For refreshment, we ordered a bottle of the house-made sangria. With white wine, Chartreuse, lime, orange liqueur, and thyme, this aromatic sangria was a refreshing departure from the usual red wine version to which I’m accustomed. 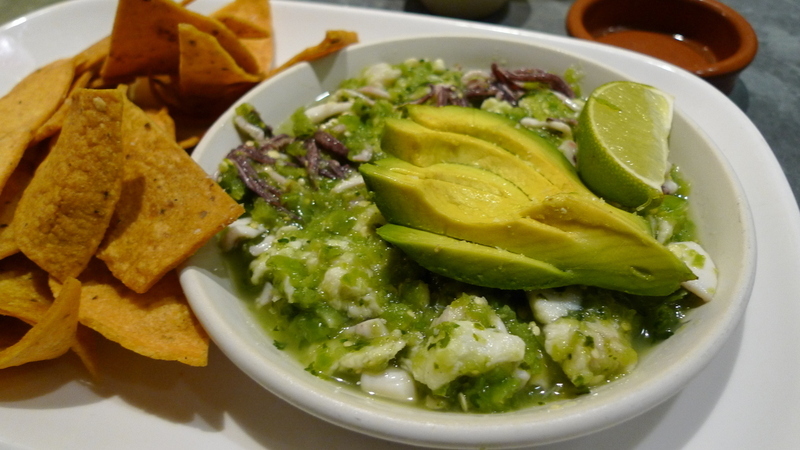 Our first dish was ceviche verde de pescado y calamare – fresh fish and squid marinated in a sauce of lime, tomatillo, jalapeno, and cilantro, served with avocado and freshly fried tortilla chips. Ceviche, which relies on the acid of the dressing to cook the seafood, is a favorite of mine and every element of this version was super-fresh. My only complaint was that the verde sauce was so thick that it overwhelmed – masked, even – the flavor of the seafood. There was no denying the quality of the ingredients, though. They were exceptional. 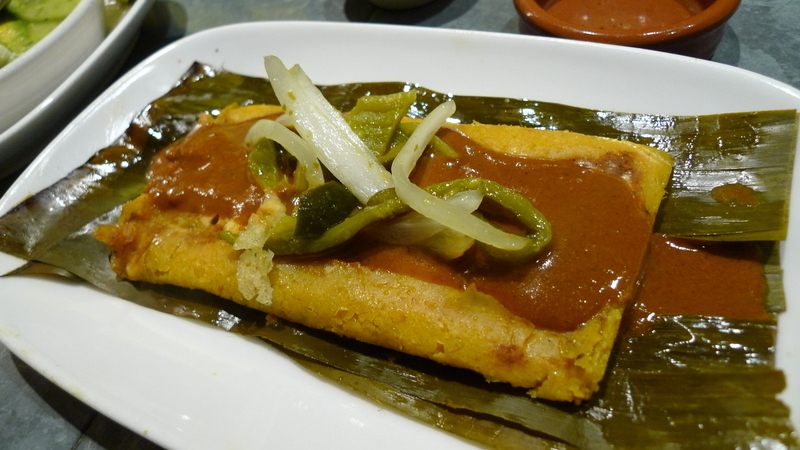 The next dish was tamal de amarillo con calabaza – a tamale of home-ground masa with butternut squash, pasilla chilies, and Oaxacan cheese, with a mole made with dried chilies, tomatillos, peanuts, pumpkin seeds, and spices. This was a standout dish with intricate flavors and none of the greasiness I often associate with tamales. We were seated right next to the counter where dishes were expedited, so continued to be tempted by all the things we hadn’t ordered. The cook on the left chatted with us several times, answering my questions about the various ingredients. You could sense that everyone working at Nopalito takes pride in the food they serve. 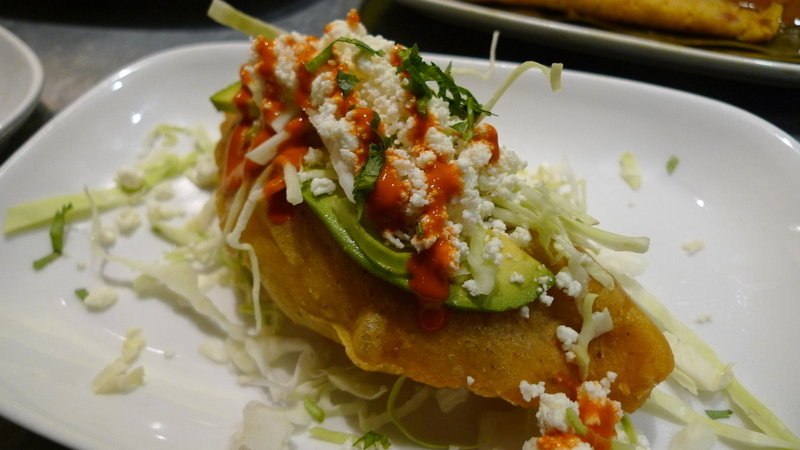 The empanada con deshebrada de res – fried masa pastry with grass-fed beef, tomato, jalapeno, cabbage, avocado, queso fresco, and salsa frita de guajillo. Empanadas, fried meat-filled pastries, can be a pleasant, if sometimes heavy, treat. This version avoided all oiliness and was light and flaky. The filling was tender but the seasoning was underwhelming. There was no doubt it was expertly prepared, but the technique didn’t compensate for the bland flavor. The next dish visually exceeded my expectations, so much so that when it arrived, I thought we had mistakenly received someone else’s order. 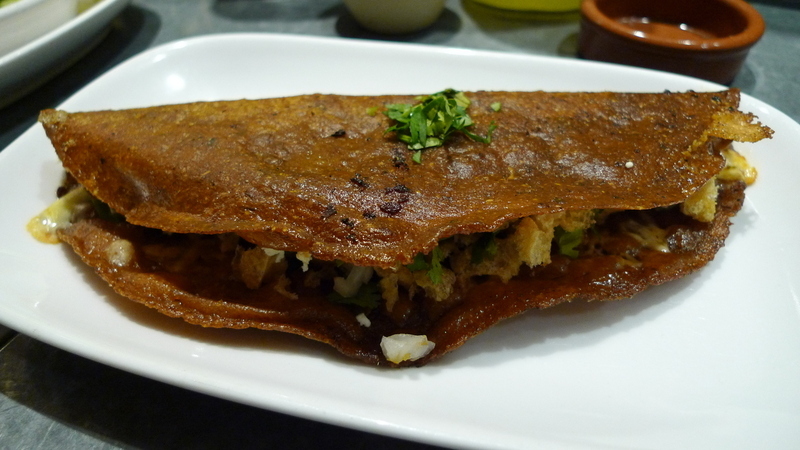 The quesadilla roja con chicharron, a crispy pork belly quesadilla, featured a mulato chile-corn tortilla, and salsa made from the cascabel chilies, which have a nutty flavor. Being a fan of pork belly, I was eagerly anticipating this dish. The tortilla had an enticing crunch but the pork and salsa were again underwhelming. Like the empanada, I was left wondering who had turned down the volume on the use of seasonings. Our final dish was an impulsive order based on what we saw coming out of the kitchen. 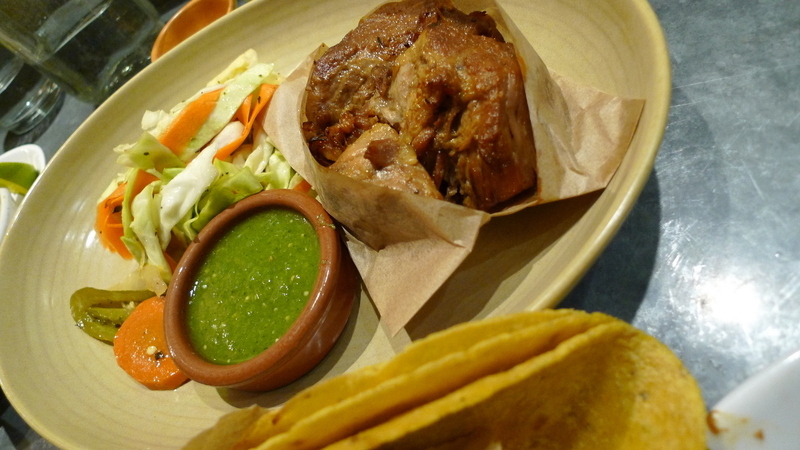 The carnitas, pork braised in orange, bay leaf, milk, cinnamon, and beer, are served in a brown paper wrapper with a side of cabbage salad and tomatillo salsa. The pork had loads of flavor, but was a bit stringy and tough to chew, almost as if it needed to be cooked a while longer. The accompanying tortillas, which we watched being made not five meters away, were so good I wanted to swear off the store-bought version forever more. With the bill (and the box of leftover carnitas for Jason to take home) we received a pair of Mexican cookies, a sweet way to end the meal. Looking back at everything we ate, it is abundantly clear that chefs Ramos and Guzman bring a level of sophistication and mastery to Mexican cooking that I’ve never seen before in the Bay Area. Quality and attention to detail are apparent in each dish. When it comes to the question of flavor, though, some dishes were more successful and others were less so. That said, I look forward to making a return visit to Nopalito to experience more of their cooking and their staff’s hospitality, and to see whether the depth of flavor is perhaps hiding elsewhere on the menu. This entry was posted in Uncategorized and tagged Dining, food, Guzman, Jossel, Mexican, Nopalito, Ramos, Restaurant, sanfrancisco by christao408. Bookmark the permalink. I prefer the homemade anything. I look for a restaurant that prepares all of its servings from scratch. You know I want to go to this place!! Nice pictures – it looks like you guys had a very good chance to reconnect. I was sort of hoping there would be a picture of the 2 of you together. Less greasiness requires less seasoning to cut it. Maybe. Seeing these pictures reminds me of food in some restaurants in India. When do you plan to go there Chris? Let me know. Would love to take you around when I am there. Now that looks like a fancy restaurant that I would enjoy. I miss nothing more about American food than Mexican, be it authentic or the cheese-filled texmex that I’ve come to love. beautiful post. the ceveche and empanadas look heavenly, and for the first time i actually want to have some sangria. @Grannys_Place – Many thanks for the recommendation. 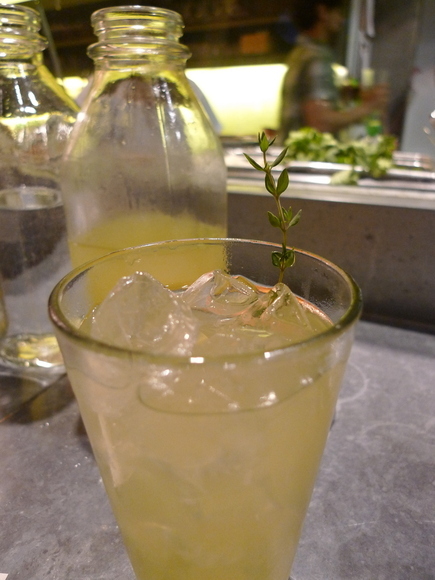 @iskrak – The white wine sangria was definitely a pleasant twist. @secade – Good Mexican food is definitely hard to find in Asia. @ZSA_MD – Oh, dear, I would certainly love to go but have no idea when. The rest of this year and most of 2013 seems to be filled already! @Inciteful – “Maybe” is the key word… =D@ElusiveWords – Don’t know how we managed to get out of there without a picture. I’m sorry we didn’t manage to get one, as it is nice to see how we age over the years. Oh, did you get the envelope I mailed you yet? @Fatcat723 – A “no cans and no frozen food” policy is practically a guarantee of a decent meal. 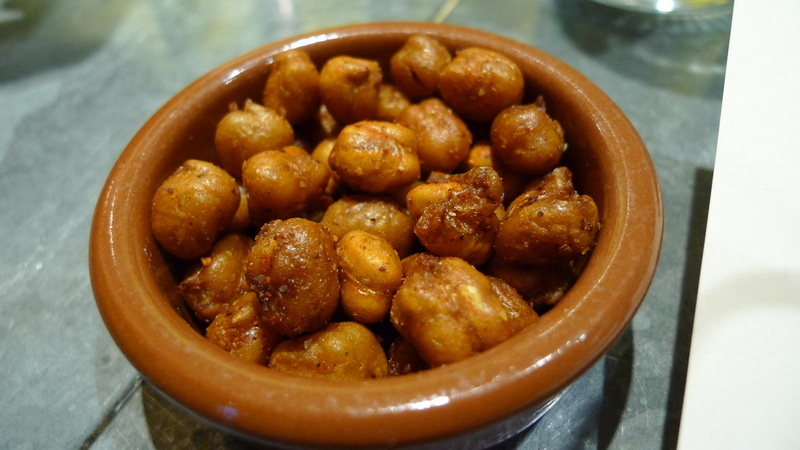 @fauquet – I wonder if some of the reason that the foods have a Mediterranean look is because of the Spanish influence? @christao408 – nothing in my mail box yet… maybe it went to Indonesia. YUM. i’m so envious of you. we only have one mexican restaurant here and it is a disappointment. they don’t even have tamales or ceviche. so sad. sigh… i’m craving that sangria and tamales. I haven’t had Mexican food in ages. There are very few Mexican restaurants in Singapore. I am hungry now!! @rudyhou – @icepearlz – I think it is safe to say that Mexican food anywhere here in SE Asia is a hit-or-miss (mostly miss!) affair. Actually, two nights ago I was chatting with a Chinese-American guy from Houston, a restaurateur who has opened a Mexican place in Beijing. He focuses on dishes from the Distrito Federal (Mexico City), which do not generally use cheese. @christao408 – mexican food in china? hhmm… i’m very skeptical of its popularity over there. @rudyhou – Not so much for locals; more for the large expat community.